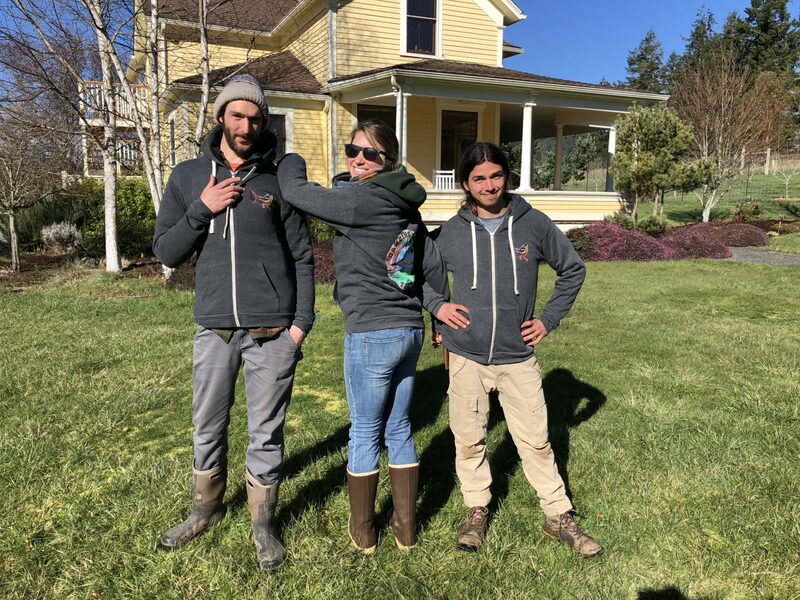 Three cheers for sunshine and spring on Dancing Seeds Farm! Now that word’s out that Dancing Seeds Farm is up and running, we’re often asked what we’ll be growing on the farm. In the early 20th century, the Schull family built a dairy farm here in the center of the island. Over the years, the land became a hobby farm, a horse farm, and a bed-and-breakfast. Most recently, it was known as Synergy Farm and produced a wide array of vegetables, berries, herbs, eggs, and pastured chickens. We all came to DSF last year with abundant enthusiasm for how we might breathe new life into this old farm and what it might look like in a few years. 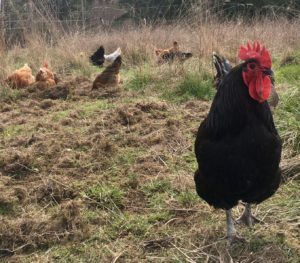 We each began to learn as much as possible about our community and what our fellow farmers were doing, and we also studied the farm itself to try to decipher what it might want—or not want–to grow given its infrastructure, water availability, soil conditions, weather patterns, existing fruits and nut trees, and so on. We also spent a lot of time sharing ideas and collaborating with one another, identifying where our visions were similar and where they might diverge. What have we decided? 2018 will continue to be a year of discovery. What that means is we’re taking the martini glass, or inverted pyramid, approach: we’re starting with a wide palate of fruits, herbs, vegetables, and flowers to see what works best. It’s exciting to have the flexibility to do that, and we’re anxiously waiting to see how everything turns out. Over time, we will likely narrow our focus based on what grows best (and what sells best). Many community members have been really helpful so far in guiding us along the way, including farmers who hang out at the Wednesday morning Grange coffees, local chefs, the SJI co-op, and plenty more. Thanks to all of you who’ve helped! And because we’re still learning, we’re open to other thoughts and ideas you might have for the future of Dancing Seeds Farms. Winter’s barely behind us but most of our fields are already tilled in, and beds are being formed and planted with early season crops such as peas, spinach, mizuna, bok choi and more. Our garlic and onions seem to be doing well, aside from needing a little TLC and weeding. We’re also still busily planting lots of herbs and vegetable seeds in the little greenhouse behind our barn. One crop we’ve been experimenting with and are excited to roll out is microgreens. We’ve been testing them in our indoor growing space over the winter and it seems like a pretty nice first interation. Studies have shown that these little babies are super high in nutritional value compared to mature veggies. Unlike sprouts, microgreens are harvested without roots and are less susceptible to pathogenic contamination than sprouts. They have a short growing cycle, and likewise a short shelf life after harvesting, so if you find yourself bringing home any microgreens, be sure to enjoy them right away! We’re also producing eggs under the watchful eye of our rooster, The Kraken. We hope to be selling some eggs and microgreens at our farm store early next month. Watch for our signs! If you would like eggs before our store is open, just stop by and come find one of us and we’ll make sure to send you home happy. The FDA’s Food Safety Modernization Act is here. If you haven’t heard about it, you probably should check it out. The FDA has been working to improve food safety since the early 2000s, and although FSMA was signed into law way back in 2011, it’s taken this long to roll out the regulations. Most SJI farms are probably exempt from many FSMA requirements, but even those who qualify as exempt need to register with the FDA this fall and have good food safety practices in place (which can be proven and validated) by fall 2019. Yup, more bureaucracy. Various workshops covered the wide range of beneficial and not-so-welcome pests in the San Juans. There are thousands of species of birds, animals, insects, and microorganisms at any given place and time, and whether or not they’re good depends on what you want to grow or do. Moreover, pests behave differently at different farms even on the same island. If you feel like you need to hire a full-time entomologist, no need to worry. WSU has one on staff to help. She is fully of knowledge, experience, and enthusiasm: Beverly Gerdeman bgerdeman@wsu.edu. After being stuck inside so much during winter (and occasionally choosing foods that aren’t necessarily high on the nutritional scale, like cookies), I like to do a little spring cleaning for my innards. There are all kinds of cleanses and detox processes, but instead of making a full-time career studying all of them, I just go with a simple one and thought I’d share it here. For 2 to 5 days beforehand, eliminate caffeine, alcohol, processed foods, and…yes, sugar. For 2 days beforehand, eliminate all animal-based foods. While on the cleanse, I drink only herbal tea and spring water infused with fresh lemon juice, raw honey, and a pinch of cayenne. Breakfast involves a healthy detox soup (see recipe below) along with a piece of fruit; lunch and dinner involve steamed leafy greens, onions, and mushrooms (including the water from the steaming process). If I’m starving, I might also have a serving of a whole grain, such as brown rice or millet, each day. The cleanse can last as few as 2 days or as many as 5; I try to go for all 5 to get the most out of it. 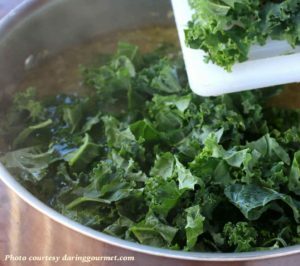 Chopped leafy greens: kale, collard greens, dandelion, etc. Bring water to boil. Add seaweed, mushrooms, and veggies. Bring back to boil, then simmer until veggies are tender. Season with soy sauce or miso, lemon juice, and vinegar to taste. Spring and fall are the two seasons when trees demand our attention. Already, Asian plum and cherry trees are blossoming and infusing the air with their sweet fragrance while other trees are transforming our island into a green wonderland. Two books that are sure t turn anyone into a tree hugger are Peter Wohlleben’s nonfiction book The Hidden Life of Trees–What They Feel, How They Communicate: Discoveries From A Secret World and Annie Proulx’s epic novel Barkskins. In Hidden Life, Wohlleben describes how his experience as a German forest manager in the lumber industry taught him to see our bark-clad companions in a new light. Weaving science with wonder, he explains how trees rely on, and communicate with, one another as well as how they live and grow at a much slower pace than we do. A cautionary reminder of our interconnectedness with the planet as a whole, the book practically forces the reader to look at trees in an entirely new way and to wonder what lessons we can learn from them. Couple that book with Annie Proulx’s novel Barkskins and you may never want to cut down a tree again. Unlike most novels, the landscape is the protagonist—the character with the most at stake–and it has no way of protecting itself from humanity’s avarice in general and the white man’s timber industry in particular. The novel starts out in the late 17th century as French immigrants arrive in Canada, and reminiscent of James Michener’s long works, it slogs its way through three ensuing centuries as it meanders back and forth between the northern US and Canada, with a side trip over to New Zealand. Predictably—but perhaps appropriately—it blames white men not only for excessive deforestation but also for disrupting the way of life for the Mi’kmaq Indian. Admittedly, the novel has received mixed reviews. But if you like delving into complex historical fiction and you want to learn about another way we’ve irreversibly changed our planet, this really is a fantastic companion to Wohlleben’s book. We’ve been invited to give a little presentation about Dancing Seeds Farm at the San Juan Island Library on April 25, 7pm. It’ll be open to the public, so we hope to see you there.